Cummings Cove is a spectacular community in Hendersonville, North Carolina. Splendid amenities give residents nearly endless recreational and social options, while abundant housing options are sure to please a wide range of homebuyers. The focal point of the community is the 18-hole, par 71 golf course. This course is challenging yet accessible and features a beautiful backdrop for a memorable game. 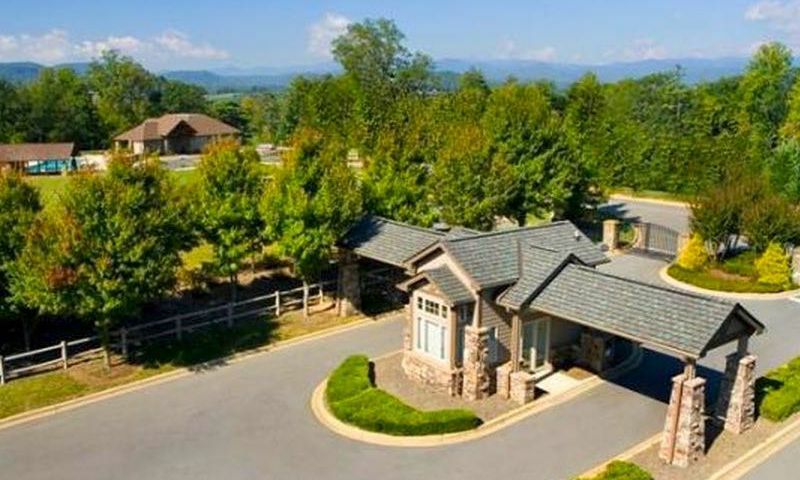 The community boasts a desirable location in Hendersonville, North Carolina. Homeowners are close to everyday shopping needs as well as being just ten miles from downtown Hendersonville. This community is a terrific option for homebuyers in North Carolina. At the center of the community is the Cummings Cove Golf & Country Club. Indoors, there is a restaurant and lounge for a relaxing dinner with friends while meeting areas are where neighbors catch up with each other. Outdoors, residents have a putting green for warming up before hitting the course. Homeowners can also gather on the patio for a quiet afternoon with their spouse. The main draw of this community is the beautiful 18-hole golf course that features sweeping vistas of the abundant natural surroundings, scenic ponds, and tree-lined fairways. All residents are required to purchase a social membership, giving access to the common areas. Golf memberships are available for an additional fee. Physical activity revolves around the sports complex that has an exercise room and aerobics studio. There's even a sauna for relaxing sore muscles after a workout and locker rooms are conveniently available on-site. A golf pro shop is perfect for stocking up before a round. Outdoors there is a beautiful pool, spa, and patio for making the most of the year-round climate in Hendersonville. The social center is an additional building that has facilities for neighborhood gatherings. Indoors, there is a meeting room, card room, and ping pong room. Outdoors, there is a picnic area, horseshoe pits, as well as a volleyball and croquet court. There is even a dog park for your four-legged friends to get some exercise. Cummings Cove Company LLC began development of this community in 1988 and will have 600 homes once complete, offering both condominium and single-family options. The community is split into four separate neighborhoods. There are a select number of condominium units available. These residences offer approximately 1,300 square feet of living space with two bedrooms, two bathrooms, and carport parking. Some of these units boast hardwood floors, gas fireplaces, and screened porches. This neighborhood is primarily made up of single-family homes. They range in size from 1,618 to 4,281 square feet with two to five bedrooms, two to four bathrooms, and an attached two-car garage. Residents love that some of these homes boast green space or mountain views, screened-in porches, gourmet kitchens, granite kitchens, and stainless-steel appliances. There are plentiful ways to stay active while living in this golf course community. Neighbors are constantly gathering for social events like wine dinners, holiday parties, music on the lawn, and luaus. Other organized events include Oktoberfest, dances, and antiques road show. Staying in shape is easy with organized groups for Zumba, tennis, Pilates, water volleyball, chair yoga, and pickleball. No matter how you like to stay active, Cummings Cove will have something for you. Homeowners love being in the charming town of Hendersonville, NC. In a short driving distance from the community are several stores including Dollar General, Ingles, banks, restaurants, and a pharmacy. Pardee Hospital is also conveniently close, as is Route 64 for getting around town. When your next destination is farther, Greenville - Spartanburg International Airport is about 45 miles away. Hendersonville is home to several unique attractions including vineyards, orchards, and antique malls. The town also has theaters, breweries, and museums. French Broad River cuts through the area, while surrounding the community are the Rhododendron Lake Nature Park, DuPont State Forest, and Jump Off Rock. Golfers will also love being near Etowah Valley Golf Club, Champion Hills, and Henderson Country Club. Cummings Cove has the amenities, homes, and location to make it a terrific community in Hendersonville, North Carolina. All Cummings Cove residents have access to the golf clubhouse's amenities. Golf is available for an additional fee. The Sports Complex is where residents go to stay in-shape or go for a nice dip. The Social Center is where neighbors come together for community events and parties. There are plenty of activities available in Cummings Cove. Here is a sample of some of the clubs, activities and classes offered here. Cummings Cove has a select number of condominium units available. These residences offer approximately 1,300 square feet of living space with two bedrooms, two bathrooms, and carport parking. Some of these units boast hardwood floors, gas fireplaces, and screened porches. Please Note: Floor plans are not available at this time. Cummings Cove is primarily made up of single-family homes. They range in size from 1,618 to 4,281 square feet with two to five bedrooms, two to four bathrooms, and an attached two-car garage. Residents love that some of these homes boast green space or mountain views, screened-in porches, gourmet kitchens, granite kitchens, and stainless-steel appliances. Please Note: Floor plans are not available at this time. 55places.com is not affiliated with the developer(s) or homeowners association of Cummings Cove. The information you submit is distributed to a 55places.com Partner Agent, who is a licensed real estate agent. The information regarding Cummings Cove has not been verified or approved by the developer or homeowners association. Please verify all information prior to purchasing. 55places.com is not responsible for any errors regarding the information displayed on this website.